« Exporting Entertainment to China and Asia-Pacific: It’s a Wrap! Anne Novak and Nancy Luther are Project Officers for the Department of Commerce’s Trade Mission to Egypt. 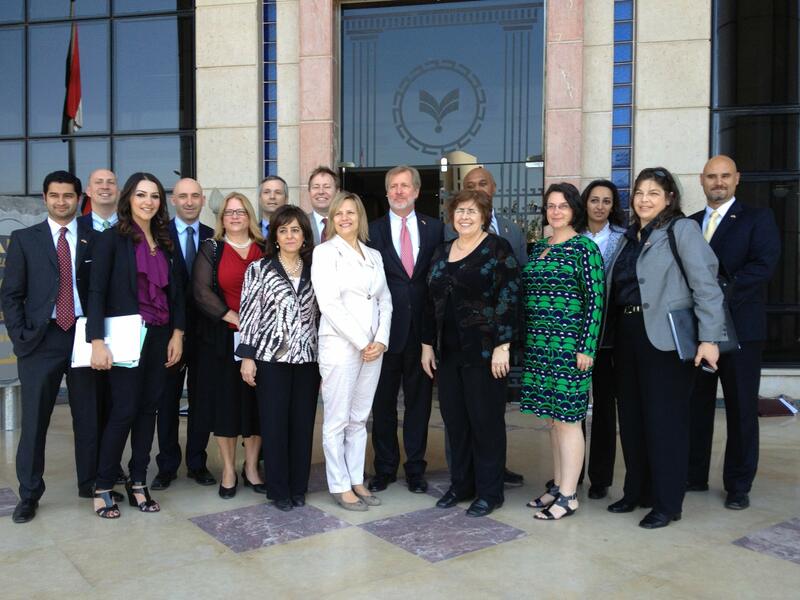 Acting Deputy Under Secretary for International Trade Ken Hyatt (center) poses with participants in the Egypt trade mission. The April 2013 U.S. Department of Commerce Business Development Mission to Egypt reaffirmed the U.S. private sector’s continued interest in the Egyptian market. Led by Acting Deputy Under Secretary for International Trade Ken Hyatt, the mission built on the positive trade relations between the countries. After two days of meetings with private sector and governmental counterparts, the U.S. delegation of companies in the alternative energy, infrastructure, and safety and security sectors came away optimistic about long-term commercial and investment opportunities in Egypt. The largest country in the Arab world with a population of more than 80 million, Egypt has historically been an attractive market for U.S. firms seeking to do business in the region. Long-term prospects remain good; American brands are highly visible, and U.S. products and technology are respected. The International Trade Administration’s office in Cairo, headed by Regional Senior Commercial Officer Ann Bacher, arranged more than 100 customized business-to-business and business-to-government meetings. Hyatt also held a range of bilateral meetings with key government officials, including Under Secretary Mohamed Omran of the Ministry of Electricity and Energy, who welcomed more involvement from U.S. companies in power generation projects as well as in technical training on managing power plants. U.S.-Egyptian cooperation in electrical and solar energy projects was a key topic of discussion throughout the mission. U.S. businesses on the mission—with their innovative technologies and services—are well-positioned to support Egypt’s electrical and alternative energy projects. This mission opened doors for new business opportunities for U.S. companies and continued Commerce’s efforts to strengthen bilateral economic and commercial relationships with the Egyptian Government. This is the second group of U.S. businesses Hyatt has led to Egypt over the last seven months. In September 2012 he accompanied a U.S. Chamber of Commerce delegation of more than 50 U.S. companies exploring the Egyptian market. A trade mission could be a key step to helping your business compete overseas. Your next customers could live in one of the countries we’ll be visiting on an upcoming mission.